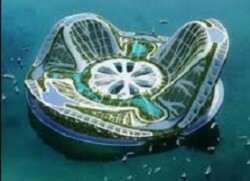 10 Apr 19 - A UN-backed partnership will study the futuristic prospect of floating cities, looking at how platforms at sea might help to bail out coastal cities at risk of flooding. 4 Apr 19 - Scientists are studying the architectural skills developed by termites so we can keep cool, dry and well-ventilated in tall buildings without using fossil fuels. 6 Mar 19 - Joni Mitchell sang, “They paved paradise and put up a parking lot.” But could parking lots soon become extinct, with the lost paradise making a return? 8 Feb 19 - Urban areas are expected to grow by 80 per cent by the end of the next decade, and unless they grow up rather than out, they could be in trouble, says a new report. 5 Nov 18 - Under a new plan to deal with higher tides, Boston will allow the rising water to come in to the city, rather than fighting to keep it out. 29 Aug 18 - Five teams have been short-listed in a global design competition that could see two Auckland carparks redeveloped as eco-housing centres. 27 Aug 18 - Nineteen of the world’s largest cities have made ground-breaking pledges to cut carbon emissions from new buildings. 6 Aug 18 - Faced with a drought, it’s tempting for city managers to reduce the amount of space that needs water. Parks, public areas and private gardens are usually the first to go. 4 Jul 18 - Not just decorative, urban trees do much more: they enrich civic life, moderate climate change and save the taxpayer millions. 15 May 18 - New evidence suggests that compounds in deodorants, lotions, hair gels and perfumes are major sources of air pollution in urban areas. 14 May 18 - California will require solar panels on new homes and low-rise apartment buildings starting in 2020. 14 May 18 - Ambitious plans have been released which seek to transform London into one of the world’s greenest cities. 4 May 18 - Auckland is signing up to go fossil fuel-free, pledging to make the city centre emissions-free by 2030 and to clean up the bus fleet. What price trees in our megacities? 1 May 18 - The ecological footprint of population growth is vast and there’s far more that can be done to improve life for urban residents around the world. 30 Apr 18 - Numerous cities are trying to do something what's known as the urban heat island effect. But there is a very long way to go. So what is holding us back, and what needs to happen? 13 Apr 18 - Governments have started to see automation as the key to brighter urban futures. But what will this look like? 6 Apr 18 - Other cities can learn from Cape Town where water supplies remain at high risk because the long-term predictions for rainfall remain uncertain. Can a city ever be truly carbon neutral? 3 Apr 18 - Upon becoming Greater Manchester’s first elected mayor, Andy Burnham announced his ambition to make the city-region one of the greenest in Europe. 21 Mar 18 - London’s reputation as a leading financial centre has now extended to include the field of sustainability.